Capt. Steven Lamps Flats Fishing Skiff. Choices are hard to make these days when it comes to flats fishing skiffs. There are so many out there and the conveluted ideas behind them seem to be endless. Having the best of the best when it comes to my bay boats I wanted to get myself a great technical poling skiff. I have been fishing flats fishing boats since 1993 and put a majority of my time on boats that were 20 ft long. The 20 ft skiffs are cool, fast and ride well but they can all accomplish just about the same thing as my current Yellowfin bay boats with less comfort.. It was time to make the larger seperration to cover my customer base better. I searched through the market very thouroughly and with my connections I had a choice of any high end skiff out there at an affordable price. 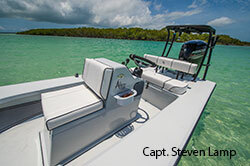 I decided on BeaverTail Skiffs built by Aeon Marine in Sarasota. My BeaverTaile Elite is 17 ft long and weighs in at less than 700 lbs. A perfect compromise to the best size flats fishing skiff in my opinion. She is 72" at the hips roughly at mid ships then tapering back as you go astern to make the "beavertail" design. My boat is a center console that fits me very well. She also has a custom sized poling platform. 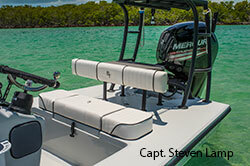 Powered by the brand new 4 stroke Mercury 90 that was released in July of 2014. 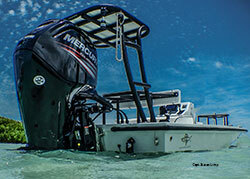 This little 350 lb motor has loads of torque and really sets the seperation from other outboards of its size. Set on a Atlas micro jack plate with 4 inch set back I am able to utilize all the power this 90 has. The Beavertail Elite has ample storage for her size with some very well thought out rod holders that can work with fly rods and spin fishing rods. Seating is very comfortable both on the built in cooler and accross the back. I find the cooler to be very large and keeps ice really well. The bottom design of the BeaverTail Elite lends itself to being a great riding boat with a 30kt cruise and witht eh Mercury 4 stroke 90 - insane fuel eccnomy. This boat is surprisingly super dry unlike many of the competitors in the field of techno skiffs and comfortable for me and my anglers in most conditions. I am Super impressed with the ride and handling, it way surpased my expectations. Shallow water is no problem for the Beavertail Elite. With the flat bottom design and progressive bow entry this boat draws less than 8 inches and has no issue getting to tailing fish with ease. When this boat was designed they set out to make the best poling skiff out there without sacrificing ride, comfort and dryness. Mission Accomplished. My skiff falls up current and keeps a real good line no matter what the wind is doing within reason. She is a little slow to spin but does it gracefully and super quiet. She takes a little time to respond to dramatic poling commands however she quickly adjusts to the minimal ones. Absolutly the quietest poling skiff I have ever been on. As a fishing guide that enjoys a boat that is easy to pole, the Beavertail Elite is a great skiff. I enjoy the ability to just fall up current, spin into any wind, silently sneak up on fish and have a glide factor that I have only seen in larger longer skiffs. Its hard to explain but this boat feels like a really good pair of shoes that you just dont mind going for a long walk in. Fishing Key West website was designed and created by Capt. Steven Lamp. Capt. Steven has been a licensed captain since 1986.